Edgy? Earthy? Classic with a twist? 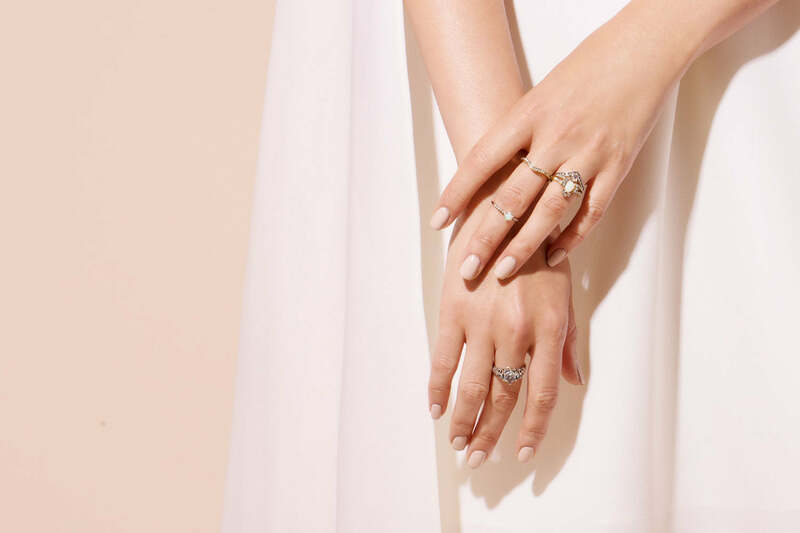 Take our mini-quiz to learn what kind of unconventional bride you are, plus get inspired by unique engagement rings suited to your style. The days of cookie-cutter weddings are long gone, and good riddance, we say. Today's brides are looking to put their own unique spin on a decidedly traditional event to create a celebration that reflects their creativity and individuality. From alternative venues to bespoke modern gowns without a hint of beading, the name of today's wedding game is decidedly fresh, eclectic and carefully curated. Need help winnowing down your special brand of contemporary wedding cool? We're here to help with this quizlet aimed at cutting through the style clutter to reveal your true nuptial vibe. Just think of us as your unconventional style Sherpas guiding you to your perfectly unique wedding day. 1. What type of weekend getaway is most appealing to you and your betrothed? A) Gorgeous Glamping — We love being outdoorsy and fancy. B) Beautiful Beaches — Gimme sunshine, a lounge chair and an ocean view, and I'm in heaven. C) City Staycation — There's always a concert or gallery opening we're dying to see. D) Haute Historic — Visiting the grand hotels of a bygone age is our favorite pastime. The Biltmore Estate? Hotel del Coronado? Yes, please. 2. You're magically granted the car of your dreams. What is it? A) A Range Rover — We're ready-for-anything folks, so four-wheel drive and room for muddy dogs works for us. B) A Moped — Cars are such a pain in the city, but I can't resist the idea of speeding through town on a Vespa. C) A Tesla — They're so sleek and cutting-edge. Sign me up, Mr. Musk. D) A Mercedes SLC Roadster — Refined and elegant, and so powerful. Rawr! 3. What type of meal do you and your DH-to-be enjoy whipping up on a Sunday night at home? A) Rustic & Hearty — Stews and casseroles. We favor stick-to-your-ribs fare to fuel our active lifestyle. B) Delivery — On a Sunday, we're down for relaxation, not sweatin' in the kitchen. "Seamless and chill," is our motto. C) The Latest & Greatest — We live for New York Times restaurant reviews. Mention the word "gastronomy," and we're hooked. D) Michelin-starred or nah —David Chang, Daniel Boulud, April Bloomfield. When it comes to great food, name-dropping is encouraged. 4. Which group best reflects the pool of go-to fashion brands favored by you and your man? A) L.L. Bean, Patagonia, Saturdays NYC, APC and mom's vintage blazers. B) Band of Outsiders, Isabel Marant and Rag & Bone, with just a splash of Vineyard Vines, TBH. C) Rodarte, Proenza Schouler, Comme des Garcons, John Varvatos. I've been known to ask, "Do you have that in gray," more than a few times. D) Brooks Brothers, Stella McCartney, Marc Jacobs, Burberry, or Levi's pared with grandma's hand-me-down Chanel. Tally up your answers to reveal your unconventional bride style. Mostly A's: You're a natural girl drawn to organic shapes and materials — down-to-earth, unpretentious, but unfailingly chic. We think this gorgeous Maniamania Ceremonial Ringwould pair nicely with your ever-so-slightly Bohemian bridal gown. With undulating 14K white gold surrounding warm, champagne diamonds, this unique stunner evokes the natural world and timeless beauty. Mostly B's: Carefree, effortless and never stuffy, you prefer curated casual to obvious extravagance. For you, life should be fun, easy and relaxed. With simple lines that are simply stunning, the Round Rosecut Diamond Baguette Ring by Jennie Kwon is the perfect embodiment of your pared-down wedding day aesthetic. Mostly C's: An unapologetic and rebellious city slicker, you're attracted to the sleek, the modern, the moment before "of the moment." Wrought in 9K white gold and boasting an unexpected black diamond, Meadowlark's Hex Engagement Ring is a perfect jewelry match for you. And who says you can't get married in aubergine? Mostly D's: You have a taste for timeless styles that veer a bit left of center. You're a little bit traditional, and more than a little bit daring. Might we suggest the White Rose Cut Diamond Bezel Set Ring by Sethi Couture. Designed to be passed down for generations, this ring fuses a classic design with a touch of modern glamour to create an ageless piece of jewelry with contemporary flair. A mix of all answers? You're an eclectic, chic gal who refuses to be pigeon-holed, and we love that. Because, in the end, it's your wedding day to do with as you please. Remember, you do you. We'll do the rest.